Eight-time Mr. Olympia Lee Haney built one of the most amazing physiques that has ever stepped on stage while being one of the very best role models in the sport at the same time. During this podcast, Lee shares the most memorable moment that he experienced during his long and illustrious career. After listening to this interview and learning about this legend, his answer will not surprise you. The IFBB Hall of Fame bodybuilder talks about how building a “solid structure” centered around his family was the most important factor in his success. Haney is a brilliant businessman who was hustling even during his competitive days and he’s only ramped things up to higher and more productive levels since his retirement. Haney fondly reminisces about his very first bodybuilding contest at 16 years of age wearing a newly purchased pair of underwear from the local K-Mart. He also gets deep and reveals his feelings about the possibility of politics interfering with his quest to break the record for the most Mr. Olympia victories that was held by massively popular bodybuilding icon Arnold Schwarzenegger at the time. Lee talks about current ventures like his personal trainer certification program, nutritional supplement company, Physique and Fitness Games, and real estate interests. He also talks about the many charitable events he is doing now and some that he has done in the past. The Mr. Olympia explains why his intelligent approach to training helped endure his entire life without a single torn muscle or any other significant injury. Haney talks about his physical and mental transition he’s made from one of the very first symmetrical and ripped “mass monsters” to the healthy, injury-free physical specimen that he still is at 55 years old. 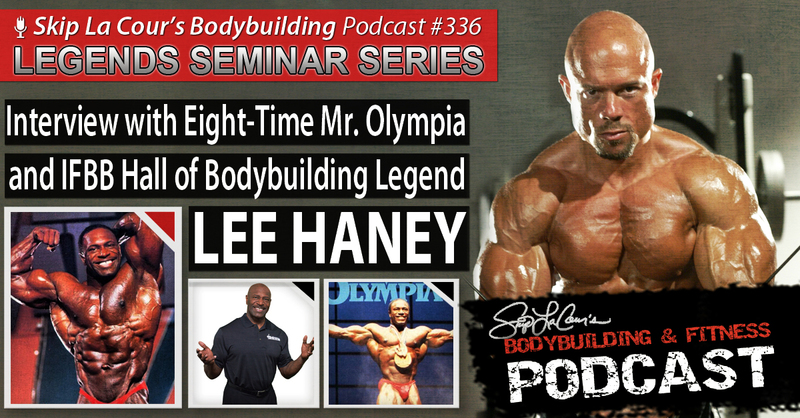 Lee tells you exactly what he thinks of the current crop of professional bodybuilders and his best advice to help them succeed at the highest level during this podcast and much more.